Marijuana stocks may have lost some of their hype since the huge surges the sector saw back at the start of 2014, but penny stocks in the industry, especially new ones, are still worth paying attention to. 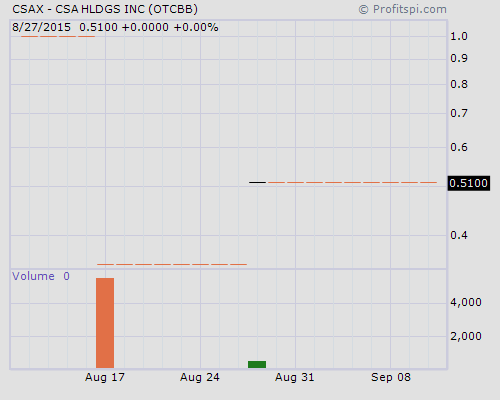 CSA Holdings Inc. (OTC: CSAX) (“Canna Security America”), a comprehensive security solutions provider catering to businesses in the licensed cannabis industry, is one of them, especially after the Company filed for an increase in their authorized shares and a 1-for-13.8 forward split yesterday. With only two trading sessions having had any shares of CSAX stock exchanged this year, 6,000 shares total, the focus on their first real trading session could spark up some high profits for those willing to appreciate their freshness. Founded in 2009, Canna Security America is designed to focus on the growing needs and peculiarities of the evolving Medicinal Marijuana industry, both in a legal and security aspect. Initially, the Company offered commercial-grade equipment installation cleanly, to code, correctly, and in a professional manner by certified technicians at discount prices. Providing a standard free service for 60 days following installation completion as well as a 1 year warranty on all equipment, one can see how the niche fill could be worth a buck or two. Canna Security America has evolved and now providies security solutions for the MMJ industry by focusing on installations of alarms, door access systems, video cameras, security system design and consulting businesses in the state licensing process. This year however, the pot business has been booming so CSA began providing cannabis business owners armed guards and armed transport services along with site risk assessments and consulting services. There were some large investments made by the Company to acquire the armed vehicles, state security licenses and highly trained staff, all of which should be visible when the next filing is released. The moves were all made in anticipation of the release of the Company’s Cloverton Group division to the Colorado market – a group created to address the need for on-site armed guards at cannabis businesses and armored transport of cash and product. The two individuals behind CSA Holdings are Daniel Williams, CEO, President and Director, and Chuck Smith, Director, who is also the COO and acting CFO for Dixie Brands, Inc. as one of the original founders of the Dixie Elixirs and Edibles Company in 2009. Smith and Tripp Keber, a founding member of the National Cannabis Industry Association, co-started Dixie Elixirs, which became well known via dealings with Medical Marijuana Inc. (MJNA), of which Keber became a BoD member back in 2012. The two also worked together at Bella Terra Realty Holdings and Sagebrush Realty Development. Originally, CSA Holdings was Asta Holdings Corp., a Russia-based development stage company created with the legal help of Strepp Law Corp. for the purposes of operating a business in yacht maintenance that would focus on repairs and maintenance, refurbishing, winterizing, custom refinishing and modifications, interior customization and professional detailing. The December 31, 2013 S-1 filing had Uladzimir Astafurau as the sole-Director and beneficial owner of 7,500,000 shares of the now CSAX stock. Back in March, the merger exchange agreement was initiated, calling for 5,054,457 shares to be issued the CSA members and, as of June 19, 9,680,000 shares were issued and outstanding – 7,500,000 which still belonged to 27 year old Astafurau. The other 2,180,000 shares were issued back in April, 2014 at $0.01 per share for total proceeds of $21,800. The Merger closed on September 4 and immediately issued to 17 accredited investors, 907,564 shares of CSA Holdings’ 5% Series A Convertible Preferred Stock at an original issue price of $1.00 per share for an aggregate purchase price of $907,563.42. Furthermore, holders of $460,000 of CSA debt, plus accrued interest of $18,063.42, swapped their debt for shares of the 5% Series A Convertible Preferred Stock on a dollar-for-dollar exchange. So what we’ll see coming is an increase in AS from 75,000,000 to 500,000,000 and a forward split of 1-for-13.8, resulting in CSAX becoming CSAXD for a month. The initial 2,180,000 shares from prior to the agreement will become 30,084,000 and carry a cost basis of $0.00725 per share. Such may be the case from an accounting POV, but when ever has a creatively designed S-1 filing followed by a merger agreement of a solid company ever stopped a ticker from running well above it’s true value? Last updated by Timothy Richards at September 11, 2015 .